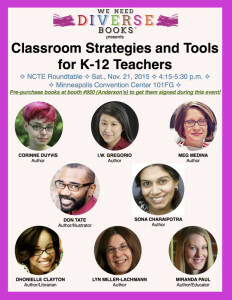 I’m scrambling to finish preparations for the NCTE (National Council of Teachers of English) conference, followed by the ALAN (Assembly of Literature for Adolescents of NCTE) workshop in Minneapolis later this week and the beginning of next. Since 2008, when I presented at a diversity-related session as Editor-in-Chief of MultiCultural Review and with advance copies of Gringolandia, I’ve been a regular attendee and sometime presenter at this well-attended conference. As an adult — and an author — diagnosed on the autism spectrum, I agree that autistic children and adults are “woefully misunderstood.” However, when you say that, Temple Grandin “is one of very few examples of individuals with autism who are capable of and willing to try to capture their experience in words and share it with others,” you deny us our right to speak for ourselves. More often than being unable and unwilling, we are shut out by people who consider us a nuisance, sand in the gears of the corporate machine. 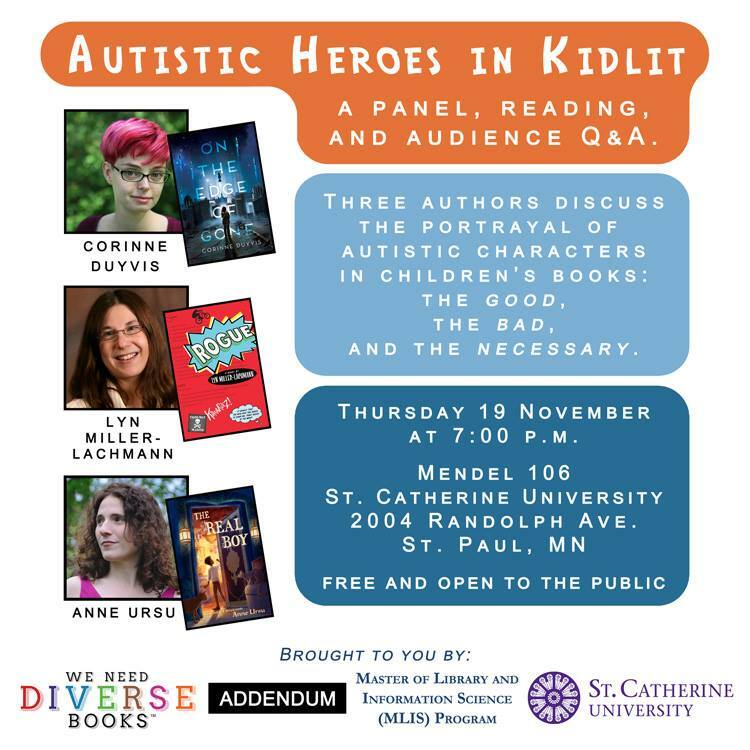 I believe that understanding of autism, like understanding of any diversity, benefits from the perspectives of both insiders and outsiders, but please avoid perpetuating the myth that we lack the language and social skills to write our own stories and get them published. I, personally, have already suffered enough because of this myth and so have many others who I know. 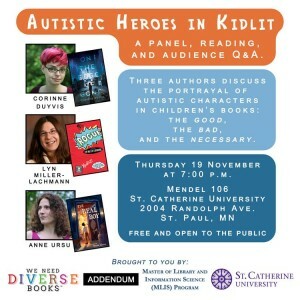 And there are people on the autism spectrum besides Temple Grandin who have written memoirs, works of nonfiction, and fiction for adults, teens and younger children. To the person who said we lack language skills — maybe she should check out my work as a professional translator. Or read Rogue and Corinne’s beautifully written forthcoming novel On the Edge of Gone. Anyway, there’s a saying, “When you’ve seen one person with autism, you’ve seen one person with autism.” It’s impossible, and wrong, to generalize. 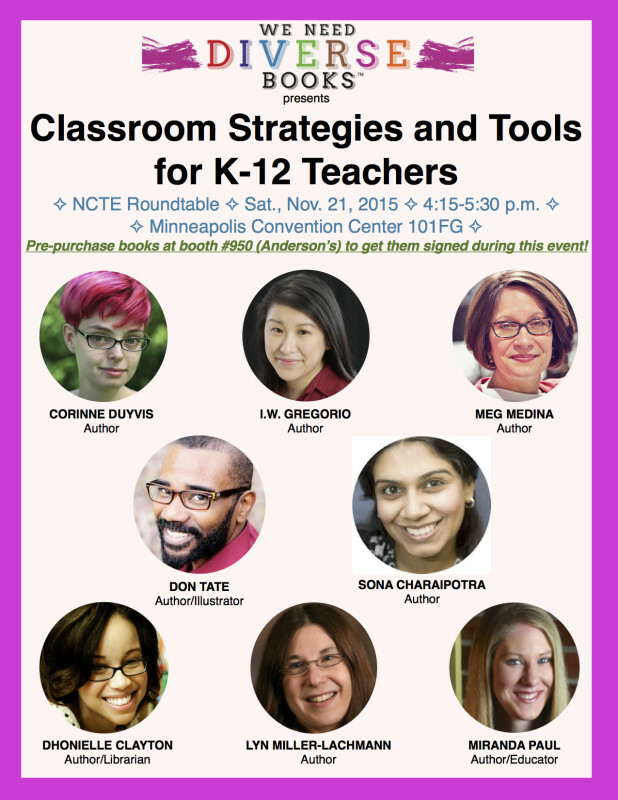 The second WNDB event, a large roundtable, will take place on Saturday, November 21, from 4:15 to 5:30 pm at the Minneapolis Convention Center, Room 101FG. Titled “Classroom Strategies and Tools for K-12 Teachers,” it features eight authors talking about their favorite books for a specific age group and/or genre, with Common Core connections for each of the books. 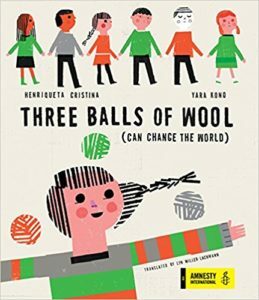 Besides me, the WNDB officers/team members/authors are Corinne Duyvis, I.W. Gregorio, Meg Medina, Don Tate, Sona Charaipotra, Dhionelle Clayton, and Miranda Paul, who has done a super job of organizing the event. My own table highlights diverse historical fiction and memoir for grades 6-10, and along with Surviving Santiago, I will present the memoirs El Deafo by Cece Bell and Inside Out and Back Again by Thanhha Lai, the fictionalized biography of Pablo Neruda The Dreamer by Pam Muñoz Ryan, and the historical picture book for older readers Half-Spoon of Rice by Icy Smith and Sopaul Nhem, and historical novels Caminar by Skila Brown, One Crazy Summer by Rita Williams-Garcia, The Rock and the River by Kekla Magoon, How I Became a Ghost by Tim Tingle, A Thunderous Whisper by Christina Diaz Gonzalez, Silver People by Margarita Engle, Climbing the Stairs by Padma Venkatraman, and Under a Painted Sky by Stacey Lee. My handout contains links to lesson plans for most of those books, and if you can’t make it to the session but would like information about any or all of the books, please contact me! I gave a well-received workshop on historical fiction at the New York State English Council conference in Albany last fall and look forward to presenting again about my favorite genre. I have attended the ALAN workshop nearly every year since 2009. For three of them, I organized breakout sessions, but I have always stared longingly at the people presenting on the main stage to hundreds of people. I love the ALAN workshop, and being a main stage presenter has been a top item on my writer’s bucket list. This year, I got my wish, and I will be on the main stage at 8:30 am along with Margarita Engle, Meg Medina, Hannah Moskowitz, and Adam Silvera, talking about diversity in our own books (I’ll be focusing on Surviving Santiago here) and why we need diverse YA books. One of the things I’ll talk about is the importance of small presses and their role in creating a “revolution in publishing.” I plan to cite John Byrd’s statistic that even with the recent attention to diversity among the major houses, nearly half of all diverse books are still published by smaller presses, from publishers like Cinco Puntos, Lee & Low, Piñata Books, and Just Us Books, where diversity is their mission, to ones like Carolrhoda Lab, Merit Press, Month9Books, and my own Running Press, which focus on quirky books and authors who don’t always fit the mold. Those who come to my book signing afterward will get to choose from a surprise grab bag, because I’m so excited about finally getting to speak on the ALAN main stage that I’m giving stuff away! I wish you could be there, Sandra, but I promise a report on these events.